I turned my horses into a neighbor's property that has a pond on it. 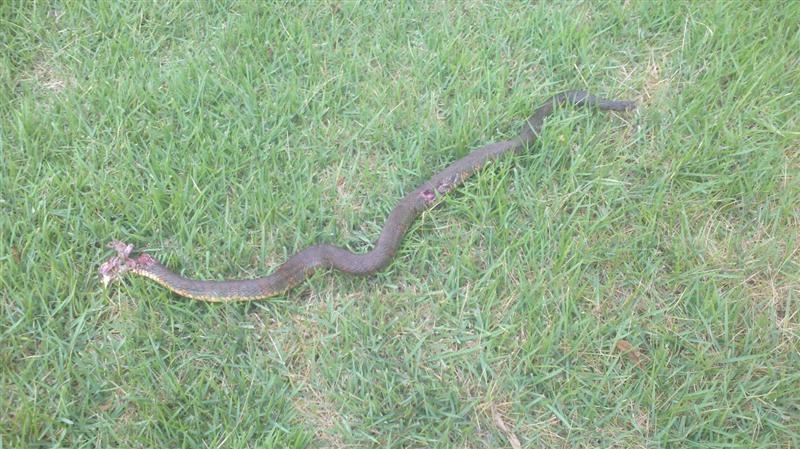 When I went to return them to my property I ran into a Cottonmouth. Couldn't shoot it because I didn't want to be launched into space by a rearing mare. So I went back today and hunted him in fine fashion as taught to me by a great deer hunter years ago. After a long arduous hunt (2 hours) I caught up with him. We dodged and weaved for a period of time and I finally got off a shot. Slowed him down by a shot to the body and one to the head (sorry for the gore). Two .45 ACP rounds from my Kimber UCC II. He measured 30" from what was left of his head to his tail. Yup, shot a few rattlers in texas and one up here I have no clue what it was. Was shooting the 44mag with the (at the time) speer plastic caps for shot #7. Bushy, is that one big enough to make a new pair of boots with? Maybe you should have let him grow some more. Surprise you haven't trained your horses to not be gun shy. The horses stand and watch me shoot on my range about 20 feet away and are not bothered by the gun fire. In fact, after a while they get bored and walk away. BUT...They are still horses and no matter how much you train them, they will prove to you that they ARE still horses. good to hear you havent lost the knack of locating game. Just read up on the cottonmouth...WOW...nasty snake...shame you had to kill it though mate. If me and my horses are going to wondering around on the neighbors property, he had to be dispatched. Besides the neighbor lady likes to walk around her property and the pond. She was very glad to hear of his demise. Nice shooting. Not to disapointed that we don't have any venomous snakes around here. Moose!! What!??! No timber rattlers? Now don't lie to us...Tell the truth. Nope, not a lieing. 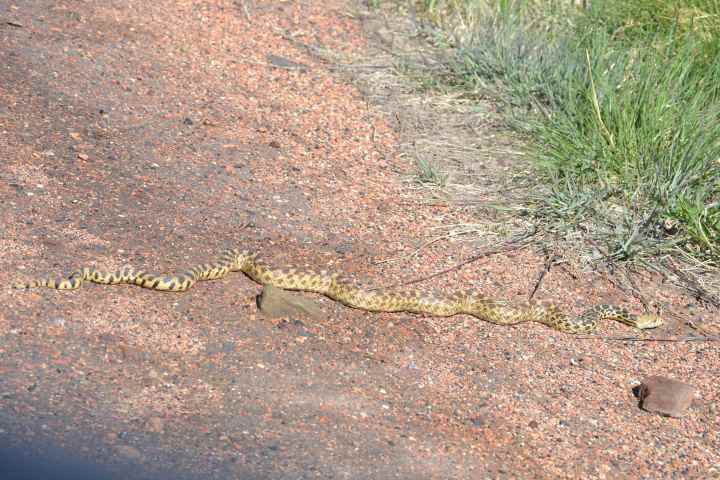 You start finding rattlers further south of here, more towards the Snake river and Salmon area and most points south of there. Those folks get to enjoy there company. P.S. As a point of interest, or perhaps non-interest, rattlesnakes are a protected species in Idaho. I'm glad we have one & one only venomous "Mr No-legs" here in the UK & he's rarely seen & his bite is very rarely fatal. We have a couple...no 5, or 10, or maybe 20 venomous snakes here in Australia...come to think of it we have most of the top 10 most venomous in the world. Im pleased they havent jumped the ditch YET unlike all those bartenders etc!! !